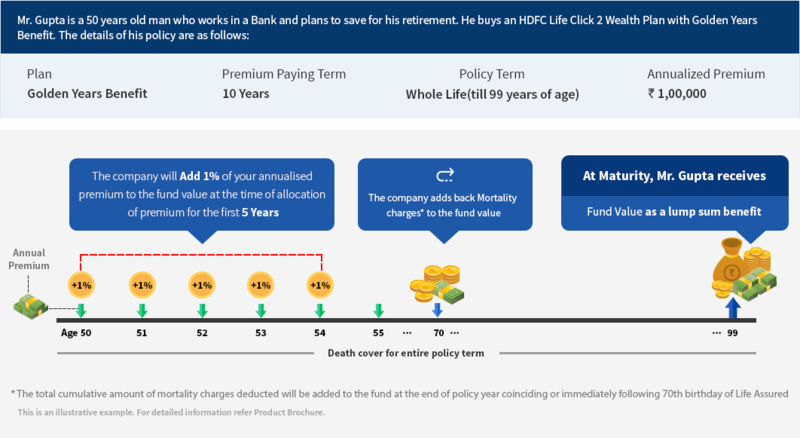 HDFC Life Click 2 Wealth is HDFC’s online ULIP plan for individuals with option of premium waiver benefit and whole life coverage with golden years benefit option. Potential of benefitting from market-linked returns. Safeguard the wealth created so that your desired goals are met. Secure your child's/ spouse's future with Premium Waiver option. Plan for your retirement with Golden Years Benefit option. Investment flexibility with 8 funds: Unlimited free switches allowed. Minimal charges : Only Fund Management charge towards managing your funds and Mortality charge towards your life cover. Special Addition : 101% of premium allocated to your fund for first 5 years1. Return of Mortality Charges on Maturity. In case of Premium Waiver option, Mortality charges pertaining to only the Life Assured would be refunded2. 1For Single premium, the special addition is 1% of the Single premium at inception only. 2Please refer section on "Fund Boosters" for more details. Premium waiver benefit that protects the future of your loved one in your absence. Choice of 8 fund options with unlimited free switching. 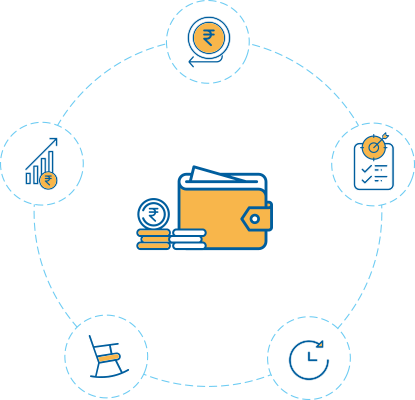 Systematic Transfer plan strategy for advantage of Rupee Cost Averaging. Premium payment options of Single Pay, Limited pay and Regular Pay. It is a Classic wealth creation option that provides accumulated Fund Value on Maturity along with the return of mortality charges. In addition to benefits under Invest Plus option, all future premiums are waived off and we will pay all the future premiums into the fund value as scheduled, in case of unfortunate demise of the Proposer. The Policy continues with risk cover for Life Assured and the accumulated Fund Value is paid on Maturity. In addition to benefits under Invest Plus Option, you stay covered for whole life(till 99 years of age) and on maturity you receive accumulated Fund Value and mortality charges are added to the fund value at the end of policy year coinciding or immediately following 70th birthday of Life Assured. On survival until maturity, the Fund Value will be paid. Fund Value will be calculated by multiplying balance units in your fund(s) by the then prevailing unit price(s). Your policy matures at the end of Policy Term and all risk cover ceases. You can take your Fund value at maturity in periodic installments under Settlement Option. Total Sum Assured less an amount of Partial withdrawals# made, if any, where Total Sum Assured is Basic Sum Assured plus any additional Sum Assured in respect of Top-ups. For death before attaining age 60: all partial withdrawals (except from the Top-up Fund Value) made during the two-year period immediately preceding the date of death. On a valid death claim of the Proposer for a premium paying policy, all future premiums are waived. On each future premium due date(s), an amount equal to the modal premium, shall be credited to your Fund Value. The Policy shall continue until maturity with risk benefits continued on the life of the Life Assured. Upon maturity, the maturity benefit shall become payable. At maturity date, the total amount of mortality charges2 deducted in respect of the insurance cover of Life Assured throughout the policy (including mortality charge deducted on top-up Sum Assured as applicable) will be added to the fund value. For Golden Years Benefit Option, which has a whole of life policy term, the total cumulative amount of mortality charges deducted will be added to the fund value at the end of policy year coinciding or immediately following 70th birthday of Life Assured. ROMC will not be available for the policies where the Waiver of premium benefit is triggered due to death of the Proposer. For Regular and Limited Pay Policies, 1% of the Annualized premium shall be added to the Fund Value at the time of allocation of premium for first 5 policy years. For Single Pay Policies, 1% of your Single premium shall be added at the time of allocation of single premium. Partial withdrawals shall not be allowed within first five policy years. The Life Assured is at least 18 years of age. The fund value after withdrawal should not fall below 150% of annualized premium for limited/regular premium paying policies and 25% of Single Premium for single premium policies. The Policyholder can also submit a request for Systematic (recurring) withdrawals. The Policyholder can avail of the settlement option for maturity benefit. The fund value will be paid in periodical installments over a period which may extend to 5 years. You can choose to avail Systematic Transfer Plan (STP) which gives you the benefits of rupee cost averaging. Policyholder can invest all or some part of his investment in Bond Fund and Liquid Fund and transfer a fixed amount in regular monthly instalments into any one of the following funds: Diversified Equity Fund, Blue Chip Fund, Equity Advantage Fund,Discovery Fund, Opportunities Fund or Balanced Fund. The transfer will be done in 12 equal instalments. The transfer date can be either 1st or 15th of every month as chosen by the Policyholder. At the time of transfer, the required number of units will be withdrawn from the fund chosen, at the applicable unit value, and new units will be allocated in the chosen destination fund. The Systematic Transfer Plan will be regularly processed for the Policyholder till the Company is notified, through a written communication, to discontinue the same. Systematic Transfer Plan will not apply if the source Fund Value is less than the chosen transfer amount. No additional charges apply on selecting Systematic Transfer Plan. This strategy will be available only if premium is paid on Annual mode or for the Single Premium payment option. All ages are of last birthday. What is HDFC Life Click 2 Wealth? HDFC Life Click 2 Wealth is a Unit Linked Non-Participating Life Insurance Plan that comes with three plan options – Invest Plus, the classic wealth creation option, Premium Waiver option, wherein the future premiums are paid by the Insurer in case of death of the premium payor (different from the Life Assured) & Golden Years Benefit option which provides life cover till 99 years of age. How does Premium Waiver option work? Under Premium Waiver option, Policy Proposer is different from the Life Assured under the policy. A benefit is provided on unfortunate demise of both the individuals. In case of death of the Proposer (the premium payor), the future premiums payable under the policy are paid by the Insurer and in the event of death of the Life Assured, death benefit payable under the policy is paid out as a lump sum. How does Golden Years Benefit option work? Under Golden Years Benefit option, the Life Assured has to pay the premiums for a limited term (till the age of 70 years at max) to enjoy life cover till the age of 99 years. The policyholder can also opt for Systematic Withdrawal facility to generate recurring post retirement income for the accumulated fund. What are the charges under this plan? Fund Management Charge: 0.80% p.a. of the fund value for Liquid Fund and 1.35% p.a. of the fund value for Diversified Equity, Blue Chip, Balanced, Bond, Discovery, Equity Advantage and Opportunities Funds charged daily. Mortality Charge: The amount of the charge taken each month depends on ages of the life assured & the proposer (for Premium Waiver option) and level of cover. As per the current Tax Laws, Goods & Services Tax and other statutory levies are applicable. Tax laws are subject to changes. Where is the premium amount invested? 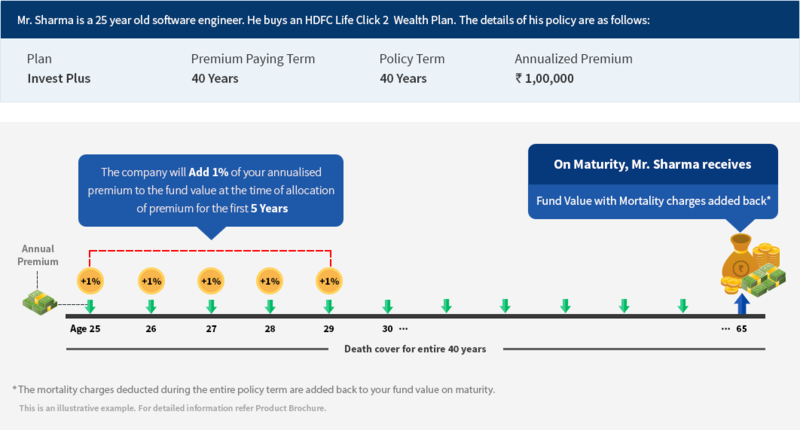 HDFC Life Click 2 Wealth gives you option of 8 different funds to invest your money. Each fund has its own Investment policy, based on asset allocation between equity, debt and money market instruments. You can invest in a combination of funds by allocating your fund between different fund options. Also, you can switch between funds using fund switch option at any time without any charge. Is there option for STP? You can choose to avail Systematic Transfer Plan (STP) which gives you the benefits of rupee cost averaging. The transfer will be done in 12 equal instalments. The transfer date can be either 1st or 15th of every month as chosen by you. Can I Top-up my premiums once the policy is active? You have the option of paying Top-up premiums in this policy. Total Top-up should not exceed the sum total of the regular/ limited premiums paid at that point of time or initial single premium paid. Top-up premiums are not permitted during the last 5 years of the contract. Top-Up Premium will carry a Sum Assured of 125% of the amount of Top-Up Premium. What is the Settlement Option? The policyholder has the option to take the maturity benefit in periodical installments over a period, which may extend to 5 years, first installment payable on the maturity date. The risk cover ceases and the fund continues to be invested during this period. Do I get any benefit on Survival? On survival of the life assured till the end of the Policy Term (maturity) under all options, he will receive the Fund Value as a lump sum benefit. How is Fund Value calculated? Fund Value will be calculated by multiplying balance units in your fund(s) by the then prevailing unit price(s). Sum Assured on death is payable as a lump sum on death of the life assured during the Policy Term. In case of death of the Proposer for a premium paying policy, all future premiums are waived. On each future premium due date(s), an amount equal to the modal premium shall be credited to the Fund Value. The Policy shall continue until maturity with risk benefits continued on the life of the Life Assured. Upon maturity, the maturity benefit shall become payable. How do Systematic (Recurring) withdrawals work? The policyholder can submit a request for Systematic withdrawals during the Policy term. Under this, at the selected payout frequency, an amount selected by the policyholder will be deducted from the fund and paid out to him. The customer can use this option to generate a supplementary guaranteed income. Is there an option for partial withdrawal in case I am in need of funds? You can withdraw money from your funds to meet any future financial emergencies. Lump sum partial withdrawals can be made from your funds after 5 complete policy years, provided the Life Assured is at least 18 years of age. Can I surrender this policy? Yes,you can surrender your policy subject to lock in period of 5 years. Once you surrender your policy, your risk cover will cease and surrender benefit will be paid out depending upon the year in which the policy is surrendered. Please refer to product brochure for more details. Is there a loan facility in my policy? No policy loans are available for this product. Can I save tax by investing in this policy? Premiums paid by an individual or HUF under this plan are eligible for tax benefits under Section 80C of the Income Tax Act, 1961, subject to the conditions/ limits specified therein. Under Section 10 (10D) of the Income Tax Act, 1961, the benefits received from this policy are exempt from tax, subject to the conditions specified therein. Please note that the above mentioned benefits are as per the current tax rules. Your tax benefits may change if the tax rules are changed. You are requested to consult your tax advisor. In this policy, the investment risk in the investment portfolio is borne by the policyholder. The Linked Insurance products do not offer any liquidity during the first five years of the contract. The policyholders will not be able to surrender/withdraw the monies invested in Linked Insurance Products completely or partially till the end of fifth year. Life Insurance Coverage is available in this product. For more details on risk factors, associated terms and conditions and exclusions please read sales brochure carefully before concluding a sale. 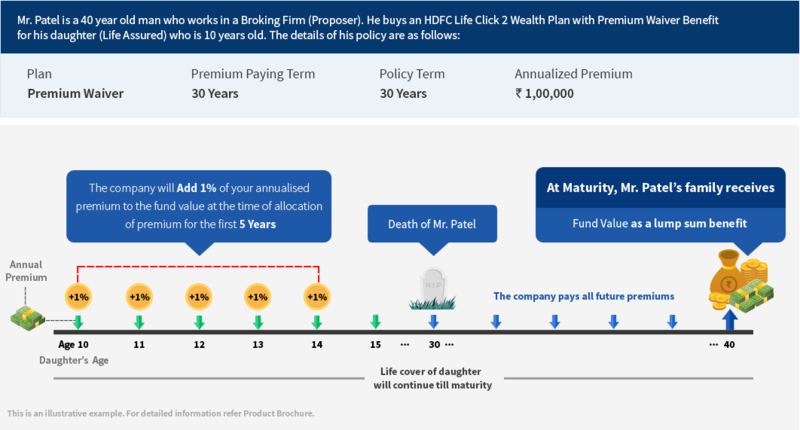 HDFC Life Click 2 Wealth (UIN:101L133V01) is a Unit Linked Non Participating Life Insurance Plan. Unit Linked Life Insurance products are different from the traditional insurance products and are subject to the risk factors. The premium paid in Unit Linked Life Insurance policies are subject to investment risks associated with capital markets and the NAVs of the units may go up or down based on the performance of fund and factors influencing the capital market and the insured is responsible for his/her decisions. HDFC Life Insurance Company Limited is only the name of the Insurance Company, HDFC Life is only the name of the brand and HDFC Life Click 2 Wealth (UIN:101L133V01) is the name of the Unit linked product. The name of the company, name of the brand and name of the contract does not in any way indicate the quality of the contract, its future prospects or returns. Please know the associated risks and the applicable charges, from your Insurance agent or the Intermediary or policy document of the insurer. The various funds offered under this contract are the names of the funds and do not in any way indicate the quality of these plans, their future prospects and returns. Life insurance policies are underwritten by HDFC Life. Purchase of life insurance policy is voluntary.